The recent comScore’s study shows that people are using long tail keywords when searching major search engines much more then they use to. 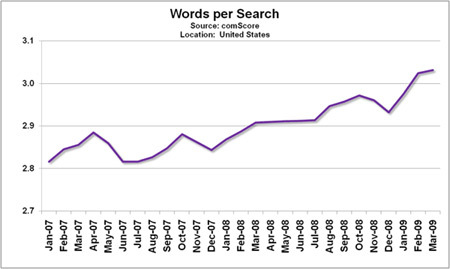 The total number of search queries have grown 3 times faster then the number of paid clicks since the beginning of 2007. The number of keywords that trigger the paid ads in major search engines have actually declined lately. The reason is not so much the world recession or paid search budget decrease. The real reason is that average users started using much longer keyword queries to find the content they want and advertisers are yet to adopt to these massive changes in search engine’s users behavior. To illustrate what I’m talking about, I will make an assumption that you are an internet power user since most of our readers are. As a power user you had to be at least a several times in a situation where some of your friends or relatives asked you for help in finding some data online they couldn’t find. The reason why you were able to find something and they couldn’t using the same search engine was in fact that you used much more accurate and longer keywords to find the content you needed. The more you use the search engines, the more experienced you get and understand how to get the best results as quickly as possible. Now, what happened here is that with time, an average internet user evolved into what we used to call a power user. They can search the web much more efficiently now and use much longer queries in search engines. Most of the advertisers in Google AdWords tend to use pretty restrictive keywords, often exact phrases or even exact matches in order to have better control over who will see their ads. Unfortunately, the good old days of driving lots of traffic with short exact match keywords might be over. This means pay per click campaigns (especially Google AdWords ones) will now have to be made out of broad matches with lots of campaign negative keywords tied to them, or else you might not be able to drive your targeted amount of traffic to the website. Thanks very much, this is really useful, the behaviour of searchers are changing.